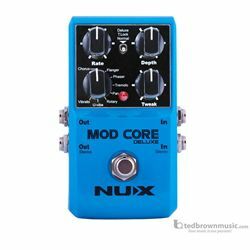 The Mod Core Deluxe is a fully-featured pro-quality modulation effects pedal. Add-in Rate and Depth controls to adjust main parameters and Tweak control to manipulate key parameters for each effect, and you get more tone-shaping options than you’ll ever find in a modulation pedal. It has 8 modulation effects with 2 types of algorithms fitting every musician's needs for sound improvement and colorization. It has Stereo Inputs and Outputs for a better experience and flexible routing, you can use Mod Core Deluxe in any effect chains with different connection methods. T-Lock is a physical dead-man switch designed to protect your parameter tweaks during your performance.